This resource could be included in the game-based learning lesson "Writing Linear Equations". It is a natural extension of using tables to find slopes. Students will use the geoboard to construct lines and find their slopes. This could then lead into an exploration and discussion of parallel and perpendicular lines and the relationship between their slopes. 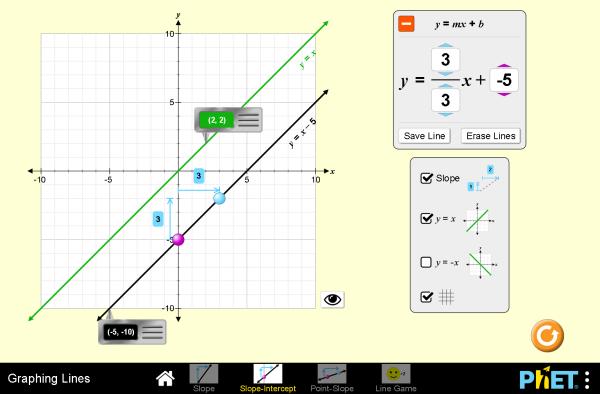 This resource could be included in the game-based learning lesson "Writing Linear Equations". This virtual function machine will allow students to gain a better understanding of the x- and y-variables in a linear equation, and allow them to see the input vs. the output. Understand that a function from one set (called the domain) to another set (called the range) assigns to each element of the domain exactly one element of the range. If f is a function and x is an element of its domain, then f(x) denotes the output of fcorresponding to the input x. The graph of f is the graph of the equation y = f(x). 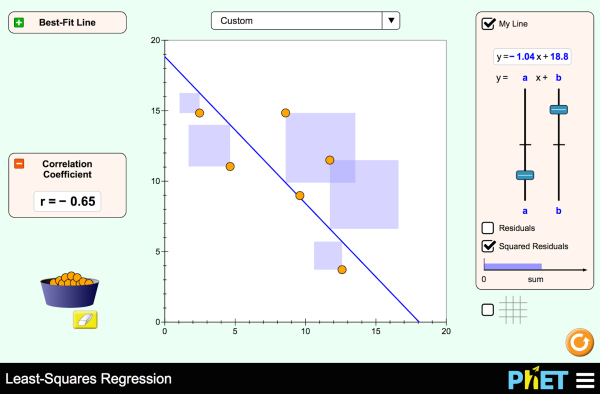 This resource could be included in the spreadsheet lesson that is an exploration of scatterplots. 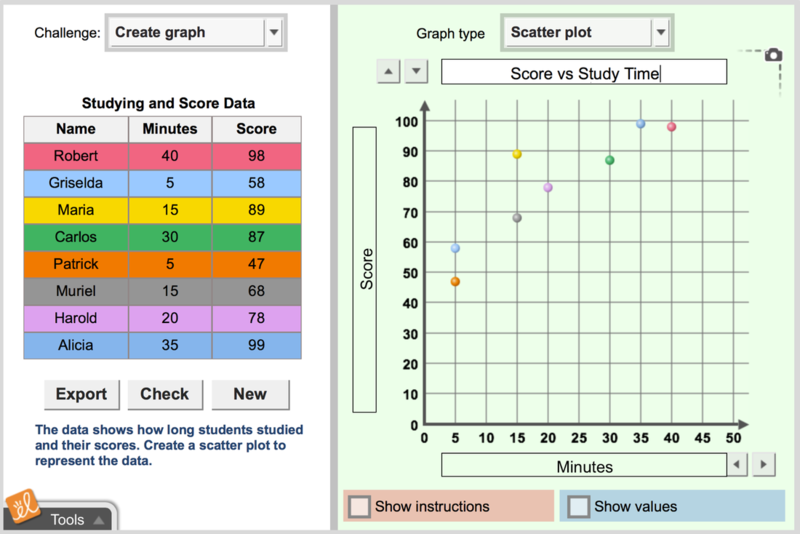 This manipulative allows students to plot points on a graph to create a scatterplot and then calculate the line of best fit. This simulation could be included in the internet-enriched lesson on parabolas. While some of the information will be hard for my students to understand, they will be able to see the simulation on the graph, allowing for a discussion of where the graph is increasing, decreasing, where the maximum is and what this means. The provided worksheets will work well in a teacher-led group activity. This simulation will be a nice addition to the spreadsheet lesson that includes an exploration of scatterplots and lines of best fit. It includes numerous scatterplots based on real data. Students can create their own line of best fit before checking the simulator's answer. Includes correlation coefficient and residuals. This simulation will go well with the video-enhanced lesson "Creating Graphing Stories". Students can close the velocity and acceleration charts, allowing them to create a graph of distance vs. time as they move the man on the graph. This could be a differentiated addition to the instructional software lesson plan "Box Plots". 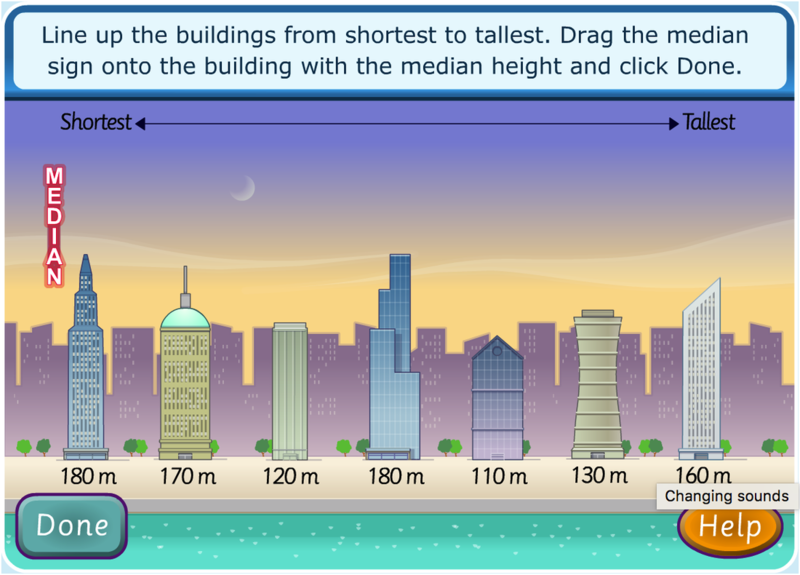 Students are asked to rearrange buildings to find the median, group them according to height to find the mode and use the given information to calculate the mean. While rather simplistic, this activity will work well for many of my students. Allowing them to manipulate the buildings will increase their understanding of the concepts. This simulation will be a great addition to both the shared docs and the video-enhanced lesson plans "Creating Graphing Stories". 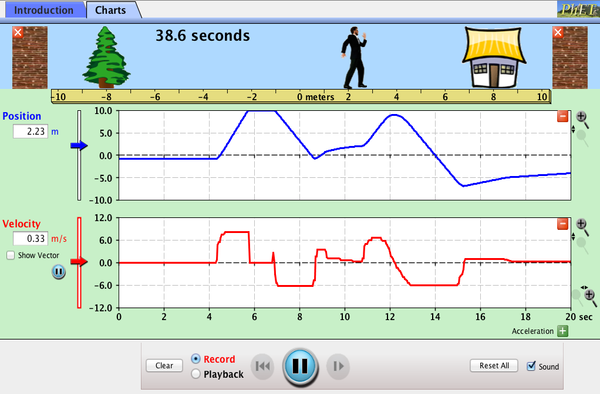 Students can graph either one or two runners. There is a slider to add points that can be dragged vertically. When the stopwatch is started, the runner(s) emulate the created graph. 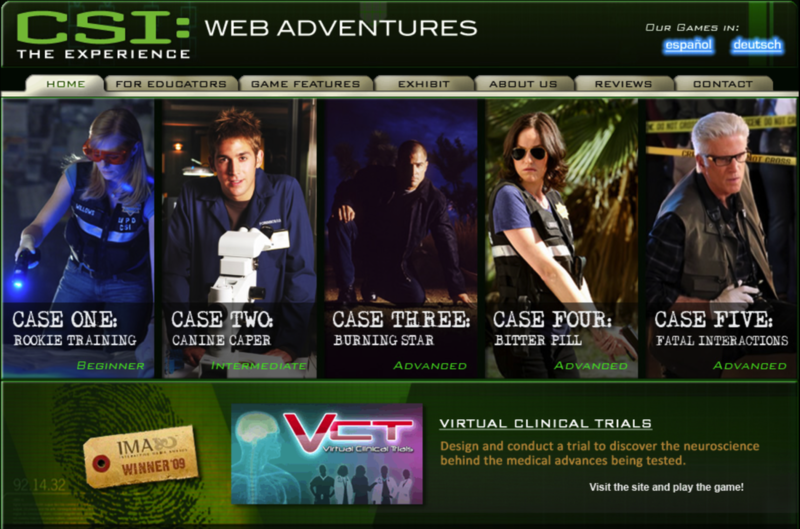 This simulation would be a nice introduction to the internet -enriched lesson "Parabola Exploration". Students can move the sliders for individual parts, allowing them to see the impact each piece has on the graph. A solid understanding of what each term does will help them successful complete the activities in the unit. 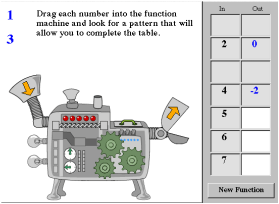 This interactive contains four activities: slope, slope-intercept, point-slope, and line game. All will fit well as an introduction to the game-based learning lesson "Writing Linear Equations". 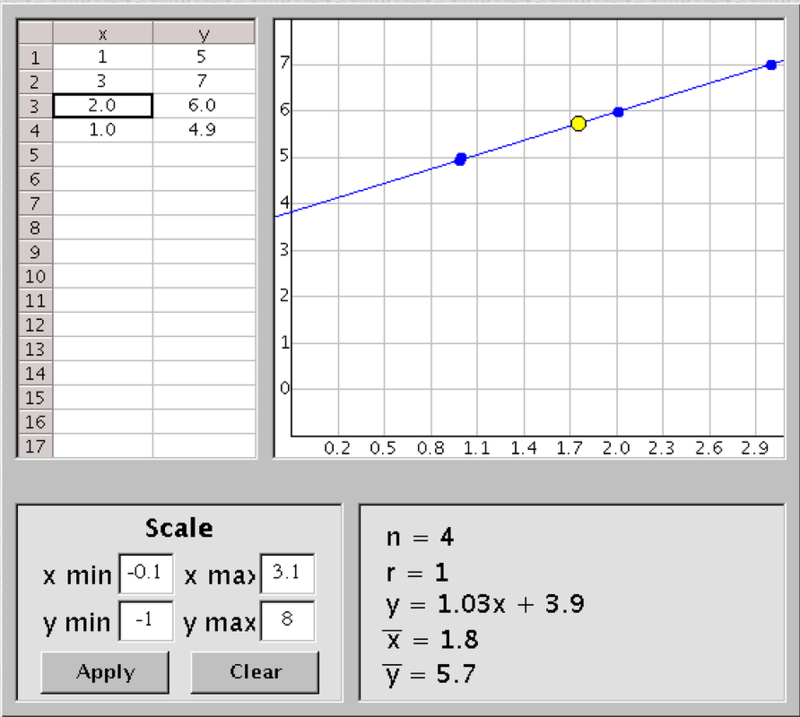 Students can explore the simulations to see the effect changing the slope, and/or y-intercept has on the graph. This will increase the levels of success while decreasing frustration when playing some of the games included in the lesson, such as Algebra vs. The Cockroaches, which is a very fast-moving game. 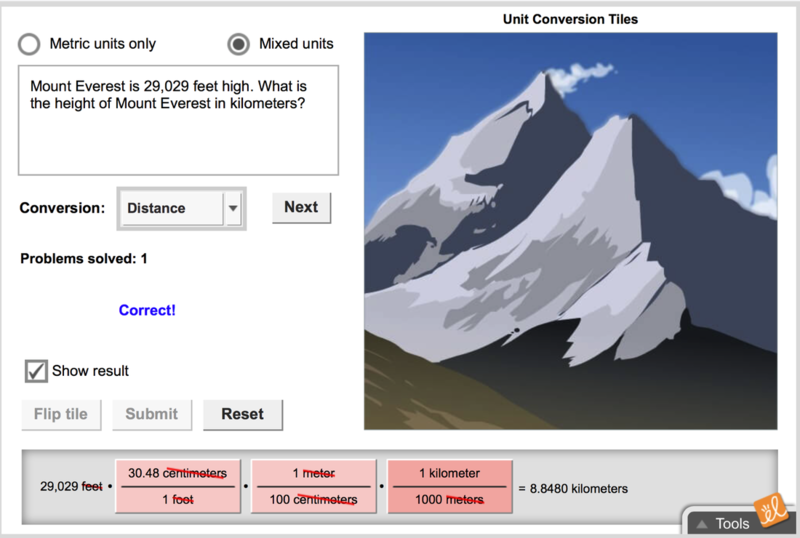 Interactive simulation for unit conversion. 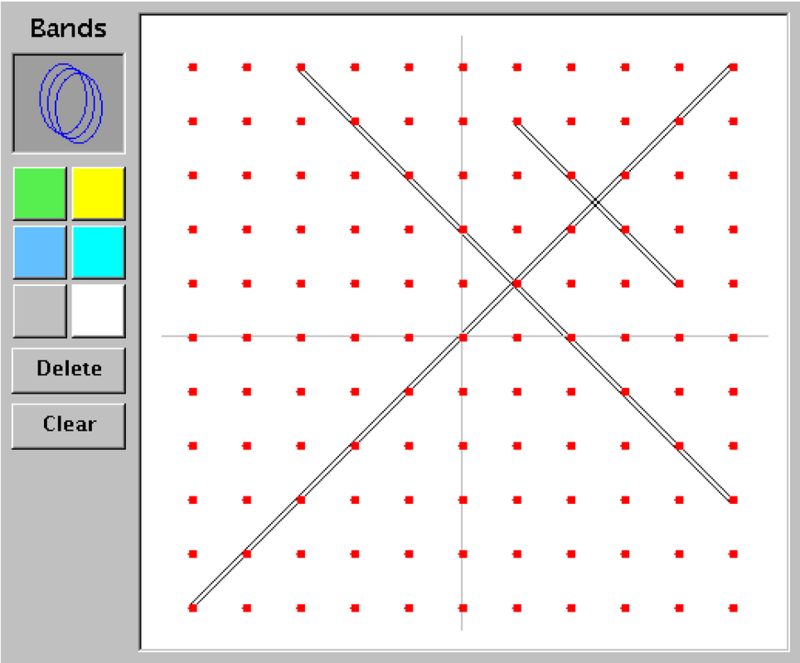 Interactive graphing simulation. Allows for the creation of a table when given a graph, or a graph when given a table. Graphs include bar, pie, line, and scatter. 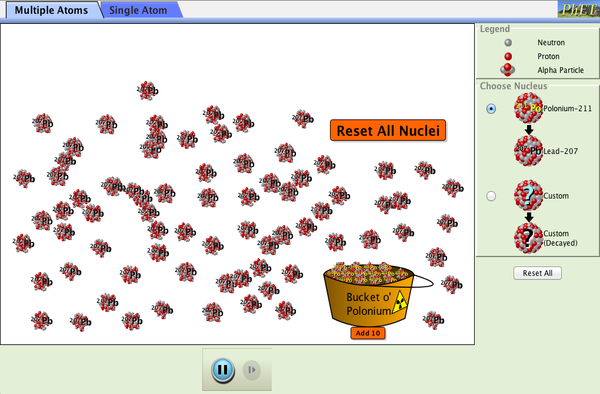 Simulates radioactive decay and half-life. Large collection of math video tutorials. Huge online learning resource for grades 5 - 12. Students can create accounts to save work and teachers can track completed lessons. Materials and resources for K-12 math and calculus. Includes links for basic skills, games, simulations, virtual math manipulatives, and project-based learning. Community of math teachers that collaborate and share materials. Does not seem to be active currently but there are many good resources available. 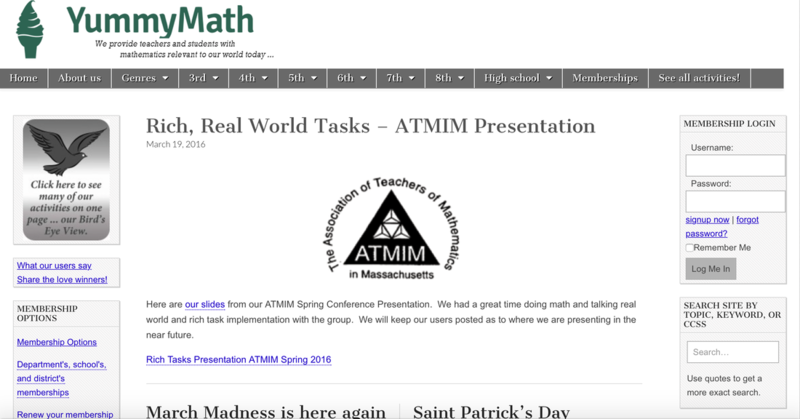 Part of NCTM, includes lesson plans, videos, interactive simulations and investigations for all levels of mathematics. Secondary level mathematics lessons and activities. This site is free. Paid sites for Pre-Algebra, Algebra, Geometry, and Algebra 2 are also offered. Third through twelfth grade Common Core-aligned math activities that use real-world scenarios.